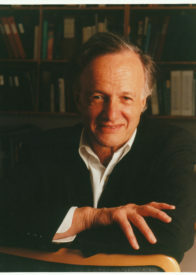 John Charles Polanyi, educated at Manchester University, England, was a postdoctoral fellow at Princeton University and the National Research Council, Canada. He is presently a faculty member in the Department of Chemistry at the University of Toronto. His research is on the molecular motions in chemical reactions in gases and at surfaces. He is a Fellow of the Royal Societies of Canada (FRSC), of London (FRS), and of Edinburgh (FRSE), also of the American Academy of Arts and Sciences, the U.S. National Academy of Sciences, the Pontifical Academy of Rome and the Russian Academy of Sciences. He is a member of the Queen’s Privy Council for Canada (PC), and a Companion of the Order of Canada (CC). His awards include the 1986 Nobel Prize in Chemistry, the Royal Medal of the Royal Society of London, and over thirty honorary degrees from six countries. He has served on the Prime Minister of Canada’s Advisory Board on Science and Technology, the Premier’s Council of Ontario, as Foreign Honorary Advisor to the Institute for Molecular Sciences, Japan, and as Honorary Advisor to the Max Planck Institute for Quantum Optics, Germany.